Fridays just got frisky at Ladbrokes Casino. Let the story unfold and join Michael and Sarah in Microgaming's Immortal Romance slot with 20 Free Spins every Friday. 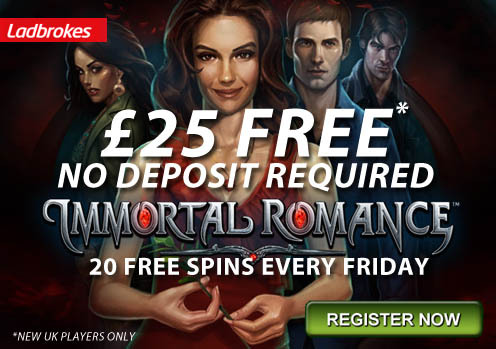 Simply deposit £20 and launch Immortal Romance slot (Download version) on Fridays and you'll get the free spins credited to your account instantly. New players - get £25 free no deposit required plus up to £500 free for depositing players.